Everything flows when you're on the court with your coach. Your movements are graceful and your strokes fluid. The tennis ball seems the size of a balloon, and the court seems as big as an ocean. For those 30 to 60 minutes each week when you hit with your coach, you feel as if tennis is a game and you are its master. Then you play a real match, and the klutz replaces the master. "Why do I play so much better in my lessons than I do in an actual game?" you wonder. It's because your pro can, to a large degree, ensure your success. By hitting the ball to your comfort zone and immediately correcting your mistakes, he or she can make you feel like a champ. Unfortunately, this feeling usually disappears when you step into the real world of match play. A tennis court can be a very lonely place when it's just you between the lines. Your opponent isn't obliging you by hitting his or her shots where you want them, and he or she certainly isn't telling you what you're doing wrong. "I wish you could be on the court with me when I play." Teaching pros hear this plea from their students almost every day. As much as we wish we could, we can't. During match play you must learn to cut the tennis umbilical cord and become your own coach. The key to freeing yourself from your dependence on your coach is to develop an understanding of your game and an awareness of what's happening on the court. From a technical standpoint, players generally make the same mistakes over and over again. Yet many players have no idea what mistakes they are making. 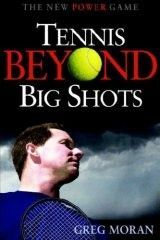 As international tennis teacher Peter Burwash says, "Most players only look closely at a shot if it's good. They bask in the glory of their great shots. If they flub one, they close their eyes in agony before the ball has even landed. The key to correcting your game, however, is watching what happens on your own errors." Take my game, for example. I know that in tense situations I tend to rush my serve and begin to hit it into the net. So when the pressure builds, I remind myself to slow down, take a deep breath and let my toss reach its peak. It always helps. On the forehand side, I know that I tend to get lazy with my footwork and let the ball get behind me. So when my forehands start flying over the baseline, I remind myself to get up on my toes and prepare sooner. At the net, I have a tendency to let the balls come to me instead of going forward to meet them. None of these corrections are highly technical, but by being aware of my tendencies, I'm able to give myself a quick reminder when one of my shots goes off. Usually that's enough to get myself back on track. Another part of knowing your game is to recognize which strengths you have and which you don't. If you don't have a reliable topspin backhand, trying to rip one past your opponent at 30-40 probably isn't a great idea. If your serve seldom goes above 60 mph, don't try to hit aces. Above all, be realistic. Many players doom themselves from the start of a match because they believe their strokes are better than they are. Then they wonder why their game plans never work. From a strategic standpoint you simply need to use your head. It's funny, but many players really have no idea of what's happening on the court. For example, if you come to the net four times in a row, and each time your opponent lobs over your head, you need to make an adjustment. Perhaps your approach shot is not deep or forcing enough. Or perhaps you should stay back unless you get a very short ball. The solution may be extremely simple. For example, if you serve to your opponent's forehand six times in a row and lose five of those points, serve to his or her backhand. It's easy to get into a trance on the tennis court and just go with the flow. But if the flow is going against you, you need to figure out a way to stem the tide. When I work with players, I feed the balls quickly and talk virtually nonstop--often to the irritation of the players on the next court. When we practice match play, I frequently ask why my students won or lost a point. I do these things for two reasons. First, it keeps their energy level up, and second it teaches them to think and react quickly. Often my players say that they hear my voice in their heads when they are playing. I love to hear that because it means that that their minds are working, and they're learning. Eventually my voice will fade and their own will surface. Develop that voice in your head. Ask yourself why you won or lost the last point. Examine what is working and what's not. Take note of your opponent's strengths, weaknesses and tendencies. If you miss a few forehands in a row, remind yourself of the simple corrections you've worked on with your coach. That will enable you to become an aware, thinking player. And the only coach you'll need is yourself.